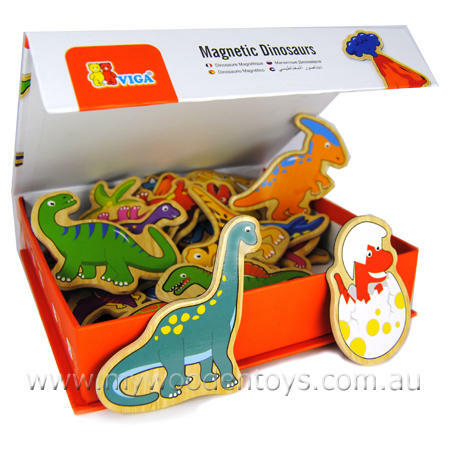 Wooden Toys Magnetic Dinosaurs this is a box full of trouble! Make sure they don't escape. 20 dinosaurs are waiting to play with you and because they are magnetic you can stick them on metal around the house and frighten people. A lovely toy, this will encourage your childs interest in the past and to learn the names of the dinosaurs. This lovely toy is packaged in a flip-top cardboard box with a hidden magnetic latch to keep it shut. Size: Cardboard Box is 19cm by 14cm by 5cm. Material: Heavy Duty Cardboard lid with magnet. Magnet. Gloss wipe clean surface. We like this because: " it looks like they are trying to burst out."